The starting density of the facade grade expanded polystyrene. It is not expensive, but very effective insulation. Closing them walls, you will reduce heat loss, and thus reduce heating costs. In this case, the walls of your home, jumpers and reinforcing belts will stop freezing, will not fall condensate inside the premises. We recommend this brand for plastering facades of individual houses. When insulation of walls "sandwich" (middle layer) we recommend to choose brand PPP 14 GOST. By the name and marking "f", you can understand the purpose of this insulation. This brand is distinguished by a special format, normal density, clear geometry of the plates and the mandatory presence of substances that prevent combustion (flame retardants). However, flame retardants are present in all our brands. This brand is particularly in demand among private developers. More dense facade foam you will find here. High-quality selection of raw materials and professional German equipment, allow us to supply the construction market with expanded polystyrene of excellent quality. About the features of the plaster facades says this article, which revealed some professional secrets. Facade foam is not a large format, which is convenient in the installation process. The process of cutting and fitting plates are on the job. Some installation teams have in the Arsenal of the machine for cutting plates with a special string. If such a tool is not available to you, then use a hacksaw with small teeth or a office knife, roughen with a large grinding skin. For installation of facade insulation, we offer to buy a special mixture. To close the joints on the facade of the mounting foam is better not to use, and try to glue the tiles evenly. If the cracks at the joints could not be avoided, it is better to seal them with strips of the same polystyrene. In addition, you need to fix the surface with special dowels. price per piece 55 rubles. price per piece 54 rubles. price per piece 53 rubles. the price per share was 51 RUB. price per piece 110 rubles. price per piece 107 rubles. price per piece 105 rubles. the price per share was 102 RUB. The size of plates: 1000h500mm, 1000х600мм, 1000х800мм at a thickness of from 25 to 300mm. 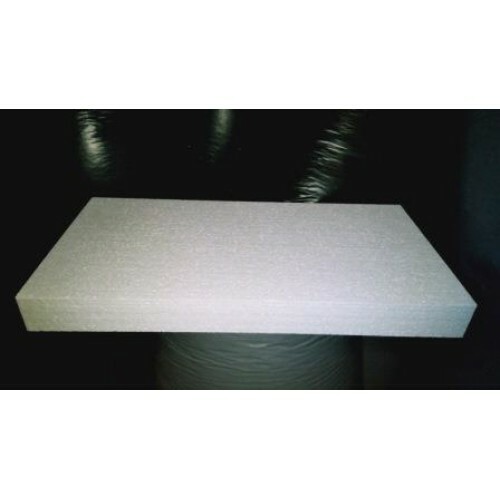 15F PPS polystyrene foam in insulation and sound insulationThe average density of the facade of the ..